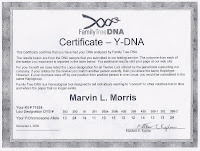 DNA testing is a mystery and I know of few that really did not have a clue as to how to go about it. Frugal Genealogy makse some very good points on what to do and what not to do as this could turn into one big and expensive bill. Thanks for the Follow Friday mention. I find the ancestral DNA subject fascinating. I also plan to reference Miriam's blog when I get to that point of my little mini series.